Late last month, Linda, Sue and I, friends and neighbors for over forty years, visited Perennial Pleasures Tea Room and Gardens, East Hardwick, Vermont...but we regret not having had a conversation with the Tea Leaf Reader Lady... Maybe next time. 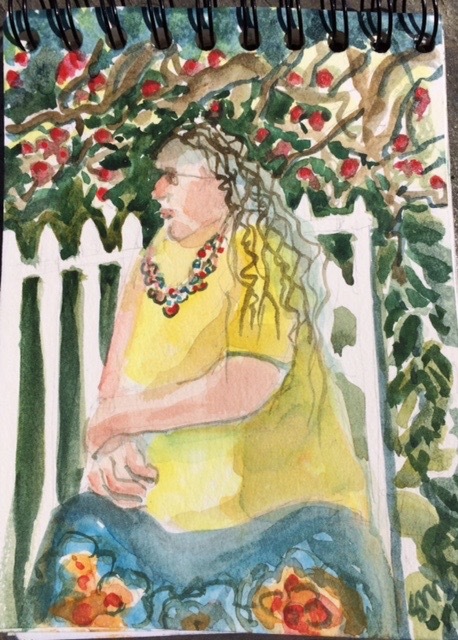 I remember her beautiful, peaceful karma while sitting under the full bloom Crab Apple tree. She never moved except to give Linda a tea pouring lesson! She must have been privy to our girl-chatter. Probably dying to read our leaves! She was dressed in a bright yellow chemise with a bright blue aloha skirt. Her long graying hair tumbled over her shoulders.